If you have read any of my previous nail posts, you probably know that I change my nail colour pretty often. The reason for this is twofold: I get bored easily, and I absolutely hate when my nail colour is chipped. When I get a chip, it drives me slightly psychotic and I have to redo all my nails at the first chance I get. So, when I heard about CND coming out with a new line of weekly nail polish, my ears totally perked up. This line of polishes is called Vinylux. I love the name as it brings to mind shiny vinyl, and who wouldn’t want their polish to look like that? CND had this to say about the product: Vinylux is a breakthrough polish system that endures a week of fashion perfection…without a base coat! Exposure to natural light secures the patent-pending technology, creating an enduring, long-lasting polish. While ordinary polishes become brittle and deteriorate over time, Vinylux dries naturally to a flawless finish and strengthens its resistance to chips over time. 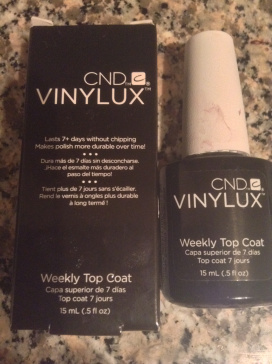 I purchased two colours in the Vinylux line, as well as the weekly top coat. The polishes were eleven dollars at Canadian beauty supply store, Trade Secrets. I tried each shade for a minimum of seven days to see if its claims were true. The Vinylux polishes come in very traditional 15 ml bottles with a regular sized brush. I really like to work with extra wide brushes like the Wet N’ Wild Megalast Salon Nail Colour. The Vinylux brushes are regular sized, but I didn’t have a problem painting with them. The formula of all three polishes was richly pigmented. They were not streaky at all, even after just one coat and dried to a super shiny finish. 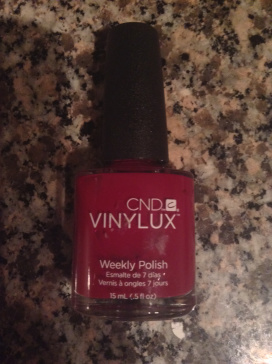 The directions say to apply Vinylux polishes with no basecoat and then paint with the weekly topcoat. 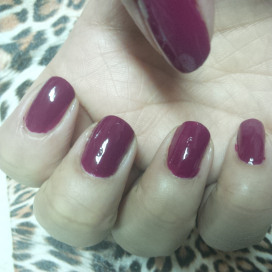 First, I chose a berry shade called Tinted Love. 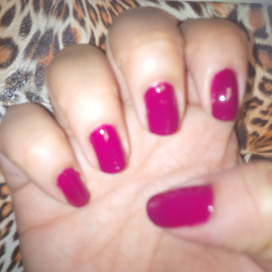 I am really loving berry hues for clothes, makeup and nails. Tinted love is a creamy berry. I don’t care much for sparkle or shimmer on my nails, so both colours I purchased are cream hues. My absolute favourite nail look is dark and vampy , so I had to pick up a colour like Fedora. Strangely enough, I’m pretty sure I have come across a nail colour called Fedora before. 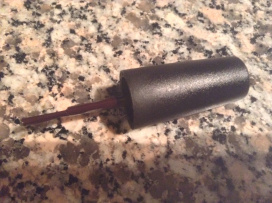 This colour is a deep burgundy that looks almost black when it isn’t in the light ( I took pictures with flash). 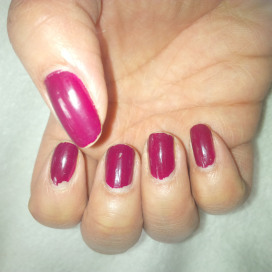 Here are the pictures of both Tinted Love and Fedora Vinylux colours after seven days of wear on my nails. I would say that the results are not too shabby. As you can see, they all have some tip wear, but no real significant chipping occurred. My nails grow fairly quickly , so the colour also grew out. However, they all stayed shiny without the application of more topcoat or maintenance of any kind. Gel nail polish definitely keeps a more perfected result, but I think that Vinylux polishes are a fantastic option for people who want to save money, have the convenience of doing their nails at home, or don’t want to be bothered with acetone removal. My one complaint about the Vinylux polishes , is that applying with no basecoat first causes my nails to yellow a bit. I like using a basecoat to prevent this, particularly with darker colours. Knowing myself, I will probably cave and change polish before the one week mark, but I love that I could potentially keep colour on that long if I had to. I will be investing in more shades from the Vinylux line, and look forward to trying the formula in Summer months. 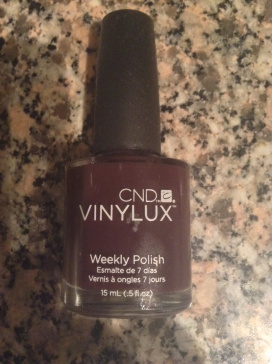 Have you tried CND Vinylux nail polish? I haven;t heard of this brand before but it looks great! 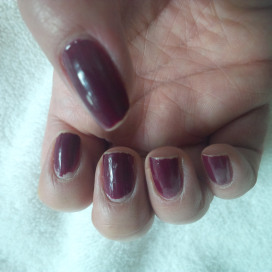 Like you, I like to change my colour often (so gel polish is out) and chips also drive me bonkers. Hi Suze. Thanks for reading and commenting. Glad to hear you love this polish. I really want to get some more Summer-y shades…baby pink sounds perfect! Sorry if this review shows up more than once with an incomplete post – my computer went wonky on me. Thanks for a great review – I love that this lasts up to a week because I don’t change my polish too often. I also hate chippy nails, and mine tend to chip no matter how careful I am. I love the colours you chose, very deep and vibrant!